At County Fair Farm in Jefferson, Andy Williamson is spending more time than usual this week lugging water to his small herds of pigs and cows and flock of chickens. With high temperature records breaking around Maine, the farm’s critters need every drop of fresh, cool water Williamson can provide. Heat and hazardous weather advisories have been posted across the state most of the week in Maine with temperature highs in the low 90s and the air feeling closer to 95 degrees with high humidity. Those conditions are predicted to last throughout the week but could reach 100 degrees, according to the National Weather Service, before a cold front moves through Maine late Friday bringing temperature down to the 70s, with less humid air across much of the state. Access to fresh water and shade during the hotter days of summer are key to a farm animal’s comfort and safety, according to Matthew Randall, agricultural compliance inspector supervisor with the Maine Department of Agriculture, Conservation and Forestry. 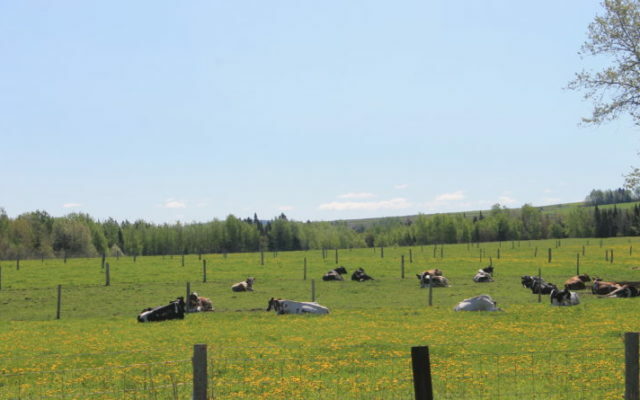 To read the rest of “Maine farm animals are feeling the heat, too,” an article by contributing Bangor Daily News staff writer Julia Bayly, please follow this link to the BDN online.